Saxophone Christmas! 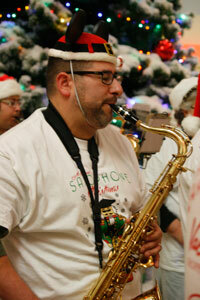 | Sharing the love of saxophones and holiday music! 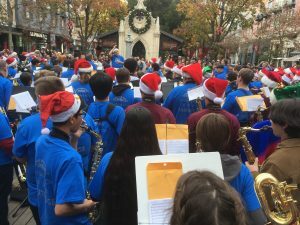 San Jose Saxophone Christmas is a holiday tradition for saxophonists from all around the SF Bay Area (and beyond!) who spend a day each December playing Christmas carols at two public performances. Many thanks to the record 227 players who participated in our 25th annual San Jose event in 2018 (photos here! ), and the record 66 players who played at our Sacramento performances! The 26th annual San Jose Saxophone Christmas will be Saturday, December 21, 2019, and the 8th annual Sacramento Saxophone Christmas is on Saturday, December 7, 2019. We welcome saxophone players of all types: sopranino, soprano, alto, tenor, baritone and bass players. We also welcome unusual saxophones (and sax relatives) – our events often include unusual saxes such as soprillos, Saxellos, C Melody saxes, Conn-O-Saxes, sarusophones, and contrabass saxes! Pre-registration for both events will open in late fall, 2019. We will also be seeking volunteers to help.